Sony | Reviews and products | What Hi-Fi? What Hi-Fi? Awards 2018 winner. Flagship features and mid-range price make for a stunning Sony TV. What Hi-Fi? Awards 2018 winner. A belter of a 4K TV. Having delivered our initial thoughts on the AF9, it’s time to turn our attention to the other model in Sony’s new Master Series: the ZF9. Sony’s cheapest native 4K projector so far is an outright winner. Sony’s LF-S50G struggles to match its main rivals in the sound department. Can this hybrid home cinema system justify the premium price tag? 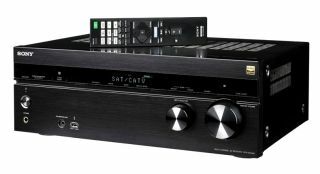 Sony has a reputation for excellent, budget AV receivers - can the STR-DN1060 continue the trend? Can Sony’s pricey high-res audio Walkman portable music player deliver sonic nirvana? A new version of Sony's over-ear headphones brings a host of new features, but how do they sound? This Sony Walkman is an object lesson in building a well realised, high-performing music player.